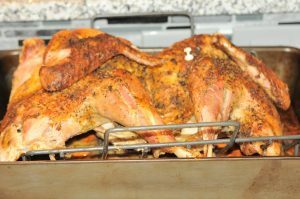 We have made several spatchcocked turkeys. Each has been delicious whether on the grill (Big green egg) or in the oven. The turkey was an experiment. I took a cue from Alton Brown’s “dry brining” and butterfly turkey technique. However Teal vetoed the idea of roasting the bird on the bare oven racks (mess factor and the oven self cleaning cycle is broken) and she was less than enthusiastic about the root veggies. 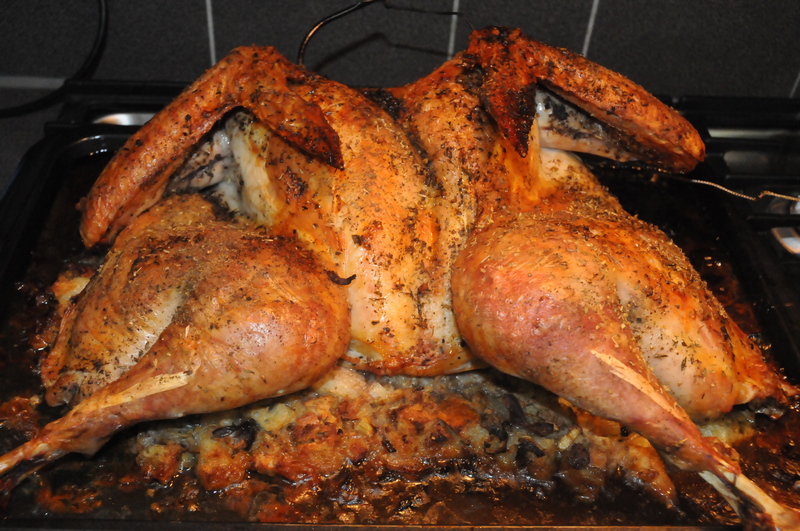 So I prepped the bird per the recipe (but added oregano) and let it sit refrigerated for a day and a half. I then oiled a jelly roll pan, placed a mound of stuffing on (extra moist). Then put the butterflied 13 lb bird on top (well trimmed of fat and tail removed). 2 hours in the oven at 375 on convect – big end to the back, until internal temp of 155 and then rest for 30 min which brought the breast temp up to 175. Meat was super juicy and tasty (beware of lots of juice while carving). The edges of the stuffing was raided as the bird was resting by the hungry horde. Definitely a keeper recipe and a nice shorter cooking time alternative. For whole meal timing, put the sides in the oven when the turkey is at 100 degrees instead of the usual 120. In the roasting pan, place 4 carrots chopped, 2 medium onions chopped 9 fresh sage leaves, about 10″ of fresh rosemary sprigs. 1.5 c water. 1c croutons. Roast at 375 for 1 hour, 300 for 1 hour and finish at 375 for 30 min. The varying temp was due to the bird not being completely thawed and the thighs needing to catch up with the rest of the bird. This was a winner and is the family favorite so far. There are some imperfections seen in the photo. There were a few sample schnibbles taken prior to the photo. The drippings were then used along with the carcass for soup stock. Simmer 3 hours and then put in the garage to chill over night. It is usually cold here in Wisconsin at Thanksgiving so the “big fridge” works just fine. This was the basis for the next day’s Turkey noodle soup. Probably the best soup stock we have made.